Paganini is depicted in an oval, playing his violin. Behind him are the orchestra. 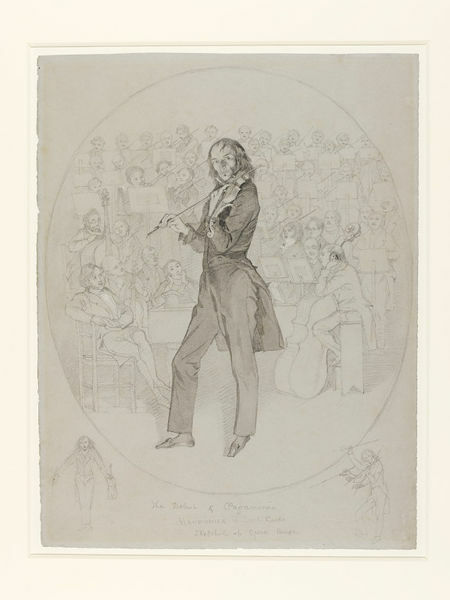 Underneath the oval, to each side there is a small sketch of Paganini, to the left is an image of him bowing, to the right is an animated image of him playing his violin. On blue paper. Inscribed at bottom of sheet. A lithograph after this drawing by Maclise, published by William Spooner, 12 July 1831, is in the National Portrait Gallery. Paganini made his debut at the King's Theatre, London, also known as the Opera House, 3 June 1831. 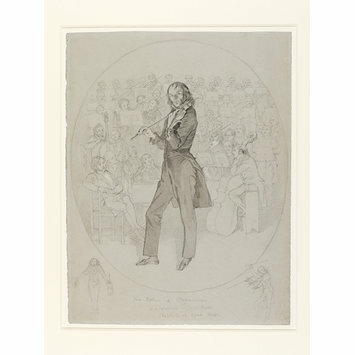 Pencil drawing by Daniel Maclise depicting the debut of Nicolo Paganini at the Opera House in London. Great Britain, 1831. Peter Murray, ed. Daniel Maclise, 1806-1870. Romancing the Past Cork: Crawford Art Gallery: Gandon Editions, 2008. ISBN: 978 0948037 665.